Do you ever get the feeling that a yacht’s layout is so familiar, you could move around with your eyes closed? That would not be the case with the 35 metre Otam yacht Gipsy. The semi-displacement yacht built at an Italian yard known for composite speedsters is not your “ordinary Otam” or superyacht for that matter. In the 1980s, Otam built hulls for the adrenaline-loving clients of Magnum and then launched its own line of fast boats. Refreshingly retro in their linear design, the yachts within the Millennium series share a fondness for the 50s (knots that is). Gianfranco Zanoni, CEO since 2009, has set several speed records in offshore racing. One of the Otams to attract attention in recent years is the raven-colored Crazy Too, an 18 metre tender to a superyacht delivered in 2014 with a top speed somewhere in the neighbourhood of 55 knots. Mr. Brown, a 25 metre powerhouse built in composite, burst onto the scene in 2015. She reached 54 knots in sea trials, leaving the yard wanting to squeeze a couple more knots out of her four MTUs and surface drives. The yard is currently building the fourth Otam 80. She has two MTU engines versus four, Arnesons by Twin Disc and an extra skylight to lighten up the forward cabin. One of the challenges the yard has set for itself is to attain low decibel levels — 50 decibels at 50 knots. 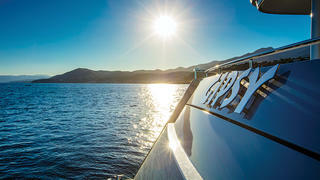 Gipsy, the first aluminium boat to be built at Otam, is literally a change of pace. An industrialist who likes classic rally cars, the client was an experienced boater looking to build for the first time. He set the hull’s maximum length to fit his slip (just a little under 35 metres). He also wanted space to entertain, as well as privacy. His personal preference was toward a trawler-like style. Otam, meantime, while excited to venture into a different market and more than willing to accommodate a close client, wasn’t quite ready to let go of the brand’s fundamentals. 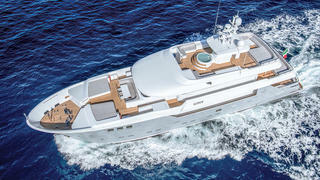 Resolving that puzzle on Gipsy fell to an immensely talented designer with more than 250 yachts to his credit, Florence-based Tommaso Spadolini. Born into a family of architects and an early sailor, Spadolini began working on boats with his father before graduating from architecture school, and he’s never looked back. In recent years, his designs have included the Rossinavi-built superyacht Numptia (now High Power III) and the superbly understated Aslec 4. The first meeting, at Otam’s office in 2014, resulted in preliminary sketches and a rough layout for the boat that would become Gipsy. Then, Spadolini requested to meet the owner at his home. 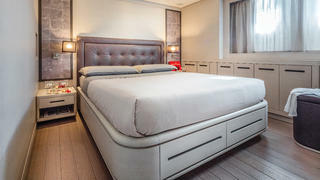 “This is very important because many things can be learned about the personality, the character and the style of the client,” says the designer, who gleaned valuable information from seeing the owner’s expansive and pristine garage and contemporary, uncluttered villa. 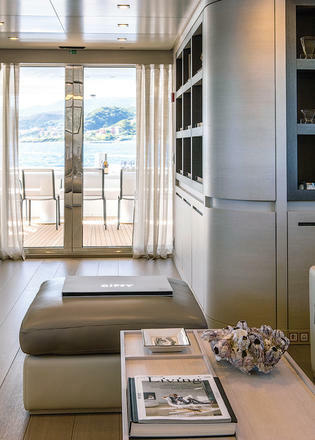 He came out of this encounter with a clear goal for the yacht’s interior, “modern with a touch of ‘design culture.’” He translated this idea into the pleasing décor on board Gipsy, which is luxurious in a discreet way — no bling, jarring colours or surfaces refracting light in unnatural ways. “The interior common denominator is the use of light or bleached wood coupled with tapestry in pastel shades of gray and dove-white. 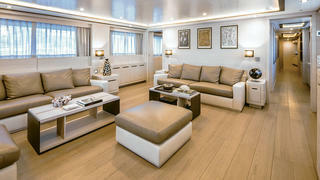 Throughout Gipsy, contemporary art is integrated with the interior design; since the yacht is lived on year-round, a lot of storage space is obtained behind each piece of fixed furniture,” explains the designer, who has fondness for wood, in part, because of its historical place in the nautical world. The wood on Gipsy is oak, treated in different ways: a more “warm and silky” finish for the guest areas and a bit more rustic in the working spaces (for the sake of longevity). The buttery feel of leather adds to the muted atmosphere, from sofas and chairs to wall panels by Poltrona Frau. Light fixtures from Cantalupi illuminate key areas; mini cascades of white light dripping on interior steps are a delightful and practical detail. From the aft deck, stairs lead straight up to a side deck. The natural inclination is to continue ahead to another set of stairs about midway along the superstructure on the starboard side. 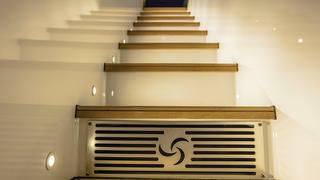 Climb these, and you find yourself on Gipsy’s spacious superyacht sundeck. 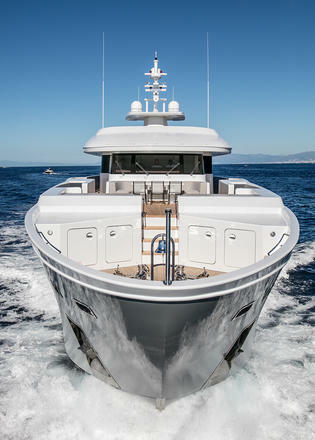 A mast at the centre conceals a day head, while seating is dispersed forward and aft. 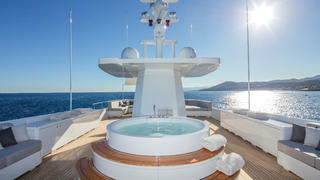 Anchored by a small round Jacuzzi, the deck is a lovely spot in the sunshine. Without noticing it, you have bypassed the owner’s deck. 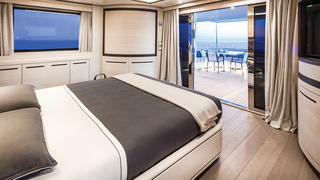 Spadolini has carved out a suite that encompasses a bright bedroom, dressing room, bathroom and a terrace looking aft on the upper deck. It’s located just behind Gipsy’s wheelhouse, which overlooks a lounge area forward. 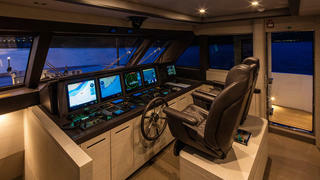 A banquette in the bridge welcomes the owner, who loves to observe nighttime navigation. Among other accessories to navigation is a FLIR night-vision camera. Two decks below are four comfortable guest suites, arranged fore and aft of an attractive foyer. 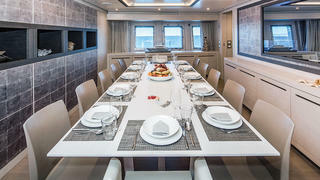 The main deck on Gipsy is about entertaining, with a dining space aft and an inviting main salon. 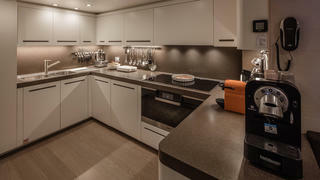 A huge and elegant galley with Miele appliances, treated with saltwater-resistant coating, has several large freezers/refrigerators along a pantry space that buffers the galley from the salon. 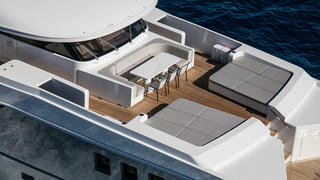 Farther forward is a full-beam dining area that seats 12 comfortably. Six big portholes open for fresh air. 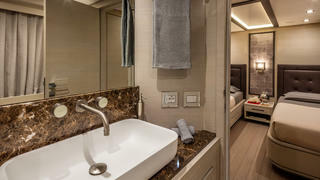 The crew, accommodated forward on the lower deck in beautifully finished cabins, has easy access to all decks via a second set of pathways. Somewhat disorienting at first, Gipsy’s layout follows impeccable logic. The exterior styling is a compromise, between the client’s desire and the yard’s mandate to keep a certain air de famille, but it’s a successful one. Gipsy, painted in her two-tone livery of white and grey Awlgrip, is appealing. “The exterior reflects the concept of simple lines. By raising the gunwales just a little bit, the use of handrails is limited only to the aft main-deck cockpit. 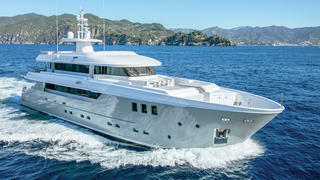 This adds to the rigorous design that makes this yacht look much bigger and timeless,” the designer says. The hull design by naval architect Umberto Tagliavini included tunnels aft to reduce the draft. 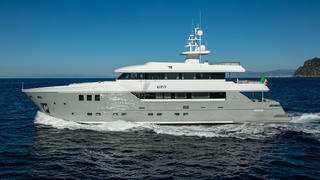 Powered with two Caterpillar engines, Gipsy has a range of around 2,000 nautical miles at 12 to 13 knots. She can reach 20 knots and do so silently. Accustomed as it is to dampen noise and vibrations on fast boats, the yard has applied the same rigorous techniques to keep the ride comfortable and quiet — roughly 7.6 tons of sound-absorbing materials went into Gipsy. 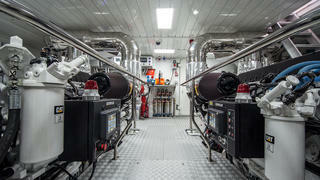 As the stateroom on the upper deck is prone to more movement, the yard opted for ABT-Trac’s electric fin stabilisers. With this convincing new addition, Otam becomes an option among a small group of yards willing and able to build mid-size custom yachts in aluminium. And what Gipsy says about them is, yes, they can!